Our own Garry Myers D.D.S., 2017-2018 president, spoke at the 2018 American Association of Endodontists meeting in Denver. RICHMOND, VA – April 4, 2018 – Through a $50,000 scholarship gift, Delta Dental of Virginia is honoring one of its own and improving access to dental care. The George A. Levicki, D.D.S., Scholarship at the Virginia Commonwealth University School of Dentistry memorializes Levicki’s service as the dental benefits carrier’s president and CEO. After more than three decades with the Roanoke-based company, Levicki retired in 2017. “This scholarship will be just one more enduring legacy of Dr. Levicki,” said Laura Thomas, chair of the Delta Dental of Virginia board of directors. “By investing in the education of Virginia dental students, we are increasing the likelihood that our best and brightest will stay right here to help improve and protect the dental health of Virginians,” said Thomas. The national average for dental graduates’ educational debt is over $250,000. On average, a dentist leaves VCU slightly more than $200,000 in debt. While VCU graduates incur lower than the national average in debt, they are still faced with this financial burden. Many new dentists choose to practice in areas with opportunities for competitive salaries and greater earning potential due to their indebtedness. Those decisions often help further the gap between service providers and those who need access to oral health care the most. Virginia Commonwealth University is a major, urban public research university with national and international rankings in sponsored research. Located in downtown Richmond, VCU enrolls more than 31,000 students in 225 degree and certificate programs in the arts, sciences and humanities. Seventy-nine of the programs are unique in Virginia, many of them crossing the disciplines of VCU’s 13 schools and one college. The VCU Health brand represents the health sciences schools of VCU, the VCU Massey Cancer Center and the VCU Health System, which comprises VCU Medical Center (the only academic medical center and Level I trauma center in the region), Community Memorial Hospital, Children’s Hospital of Richmond at VCU, MCV Physicians and Virginia Premier Health Plan. For more, please visit www.vcu.edu and vcuhealth.org. For more about the VCU School of Dentistry, please visit www.dentistry.vcu.edu. Delta Dental of Virginia is a member company of the Delta Dental Plans Association, the nation’s largest, most experienced dental benefits carrier providing dental coverage to more than 75 million people in more than 139,000 groups across the nation. For additional information about Delta Dental of Virginia, visit www.deltadentalva.com. 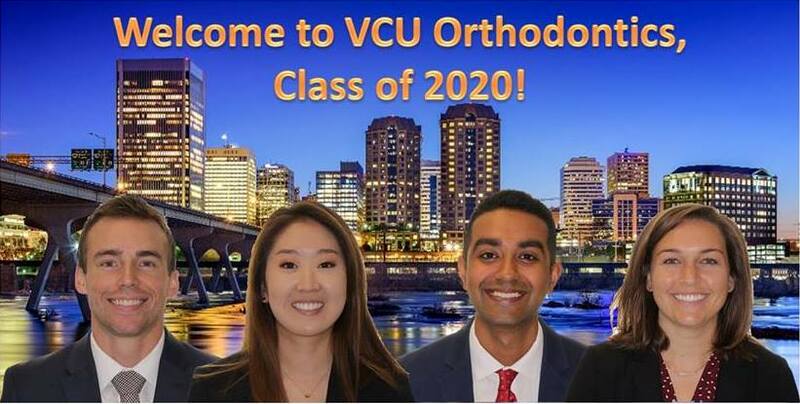 Welcome to VCU Orthodontics, Class of 2020! The VCU School of Dentistry plans to offer an M.S. degree in Oral Health Research starting in Fall 2018. The M.S. is a two-year program and is designed with two groups of students in mind. For students who plan to apply to dental school, the non-thesis track focuses mainly on didactics including core courses and first year dentistry courses. Students will also undertake a small research project. For students who are interested in research, the thesis track focuses on completion of a research thesis. Students will also take core didactic courses and electives in particular areas of interest (e.g. cancer, microbiology, immunology). Please complete the inquiry form to express your interest in the program. You will then receive more information on the curriculum and on the application procedure.